Klein ISD is dedicated to academic achievement and success for all students. Regular school attendance is an essential part of that success starting in Pre-kindergarten and continuing through high school. Students who are absent from school, miss out on learning. Improving student attendance is a key strategy to ensure students are on-track to learn and to reach their full potential. Children who miss too many days in kindergarten and 1st grade are much less likely to read at grade level by the end of 3rd grade. In the 9th grade, school attendance is a better indicator than test scores of a student’s likelihood to graduate from high school. 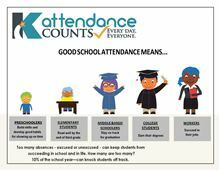 Your child's success begins with attendance. Parents and families play a key role in making sure students get to school every day and on time. Our students are very important to us in Klein ISD and we want them to be with us each school day. Click on the photo to listen to Dr. Champion's attendance message. View these informative videos from Attendance Works by clicking on the titles. See Student Handbooks to learn more about attendance requirements. For more information contact the School Attendance Office.